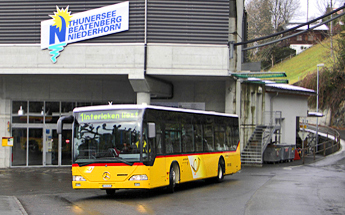 The best way to go from Bern to Interlaken is to take the train from Bern to Thun, then continue your trip by boat. There is always a boat waiting for you just in front of the train station of Thun ... only 10’ for the transfert. 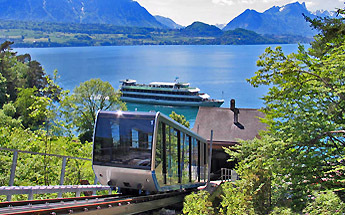 Then you have a wonderful trip on the lake of Thun. On the right bank of the lake there is Spiez and the Niesen. On the left bank there is the Niederhorn. 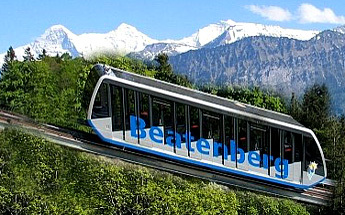 The boat stops at Beatenbucht, and there, the funicular Thunersee-Beatenberg is waiting for you. In 10’ it goes up to the wonderful balcony of Beatenberg. 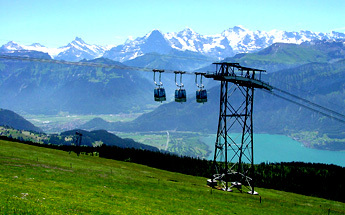 You can continue your trip with the new aerial cable way up to the Niederhorn (1949 m).